Florence became the owner of a whole new home today, 8 acres of beautiful birch and pine forested land with a babbling brook. More to follow… stay tuned! It’s difficult to believe that I forgot to wish Florence a happy 4th birthday, because she and I share one! So, a happy belated birthday to Florence! The best home away from home anyone could know. It’s also tough to believe that Florence has been in our lives for four years, it seems like an eternity, and buying her seems like yesterday at the same time. Florence is going to have some new adventures in the upcoming months, so despite the near radio silence on this blog, be sure to stay tuned to find out more about what she will be up to. Posted on September 15, 2018 September 15, 2018 Author silver slickerCategories Airstream, Hipster Homesteading, Observations, What I'm DoingLeave a comment on Happy 4th Birthday, Florence! My mom tells me that tomorrow is a super blue blood moon—that means that it’s the second full moon in a month, AND a full lunar eclipse. It has happened only once in the last 152 years! The moon looks plenty full tonight, and on such a chilly night, Florence is looking very warm and toasty, thanks to her newly repaired Dyson Heat + Cool Link. Today, I was driving to work and there was this big spider  that had crawled out of my side mirror and as I was driving down the 400 at 70mph, this little spider was getting really tossed around but was hanging in for dear life. He was getting thrown so violently, I initially thought there was no possible way he could be alive. I pulled over, rolled down my window and stuck out my finger to help. He immediately crawled on to my finger and stopped. I brought him into the car and put him on my knee for a moment and let him catch his breath and get his wits about him. After a few minutes, he started spinning a little web on my knee. We talked about it and decided that my knee probably wasn’t the best place for that, and I suggested he explore my passenger seat instead. He crawled around and found a very nice spot between the center console and the seatbelt clicker thing. After 20 minutes or so of sitting at the side of the road, we continued driving. I commented how surprised I was that he a survival instinct and how difficult it must have been to hold on despite the wind. He made a good point that the wind for him, would be relative to me being in 800mph winds. I told him how impressed I was that he was able to hang on and he explained that the tensile strength of the silk he is able to spin helped him to hold on. Regardless, I found his will and ability to survive impressive. We chatted for the rest of the ride and decided that it might make better sense to live inside the car. So for the time being, my car is +1 spider. The bed in Florence is a peculiar size. It’s just smaller than a full and is in fact a “three quarters” size. The peculiar size was once a common bed size in America until the old bedding size system was standardized after WWII. 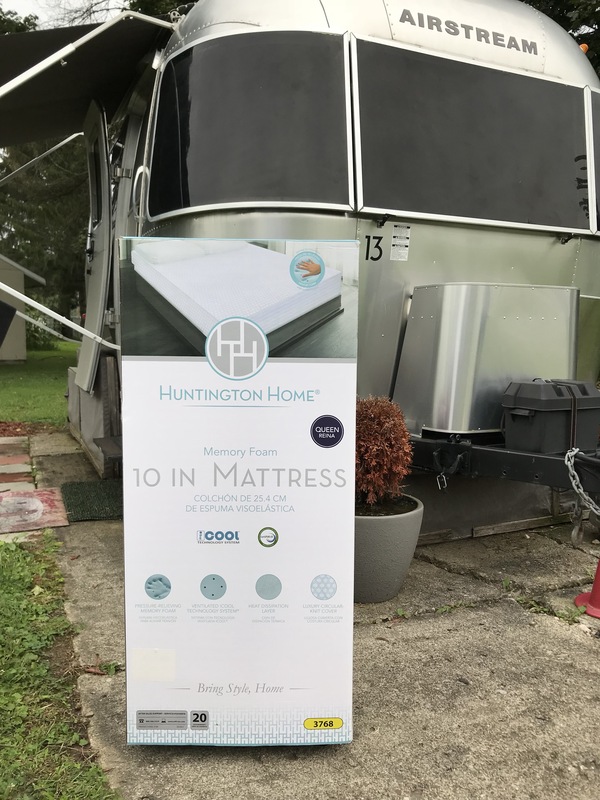 The mattress is also rounded at two corners to accommodate the rounded sides of the Airstream frame. This makes finding bedding difficult and more complicated. 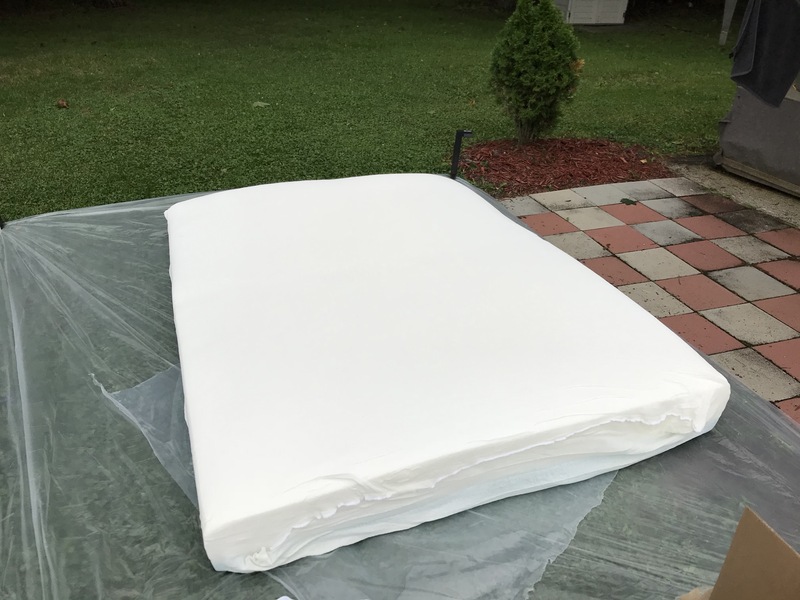 When I purchased Florence, I made a mental note to buy a new mattress. Three years have passed and I never found the time to do it. After purchasing a Casper mattress for my home, I wrote to Casper asking if they could make a custom size one for the Airstream. They never wrote back. So for a few years I slept on a sturdy cot-like mattress. It wasn’t uncomfortable but it wasn’t luxurious either. I began shopping around for a mattress and was surprised to find that the cost was not insignificant. Ballpark was about $800-1200 for a custom mattress. Which, as always, is when my very favorite store in the world came through for me. This past week, ALDI featured memory foam mattresses for $219. That was the lowest price I could find anywhere and just like the Casper mattress, the ALDI version came with a 10 year warranty. So, I bought one. 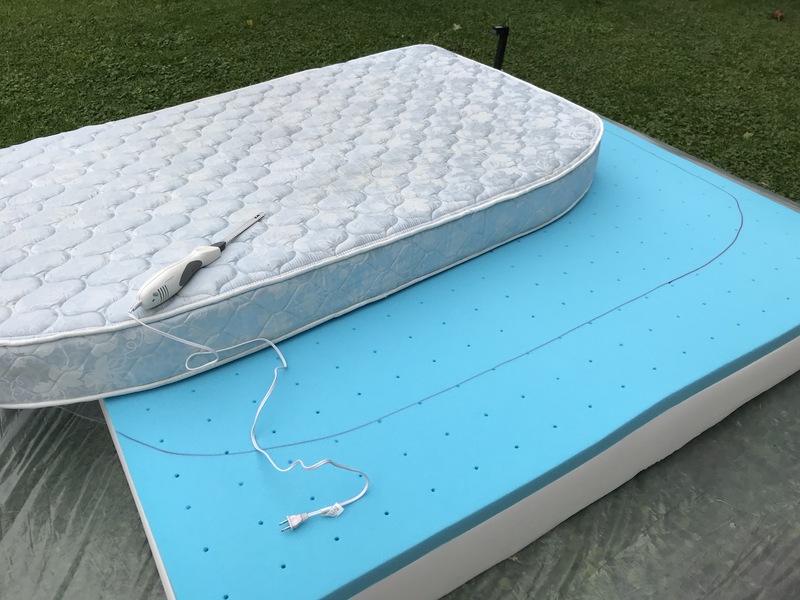 I used my mom and dad’s electric turkey carving knife to slice the foam and replaced the cot-like mattress. Amazingly, it was easy and is tremendously comfortable. Honestly, it’s as comfy as the Casper, of which, I am a huge fan. I also made a friend with a slug while I was cutting the mattress. I interrupted his happy home with my cutting activity. 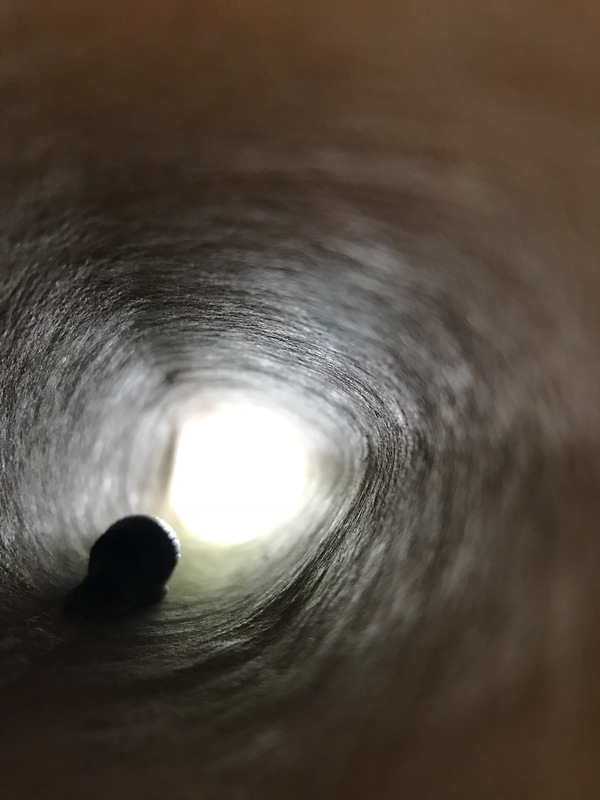 Mr. Slug is nownhappily living in a paper towel tube outside my Airstream. 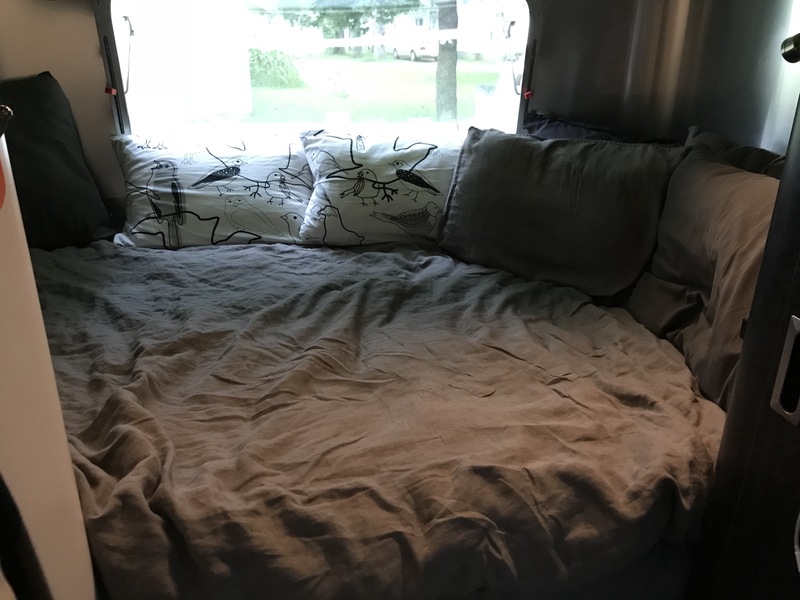 Also, for those interested, I have found that European-size bedding including square pillows and “single” comforters fit the Airstream perfectly. You can find great bedding at Hema in The Netherlands and Central Europe or Hemtex in Estonia and across Northern Europe. Police and Fire vehicles like to zoom through Delaware Park on the ring road. 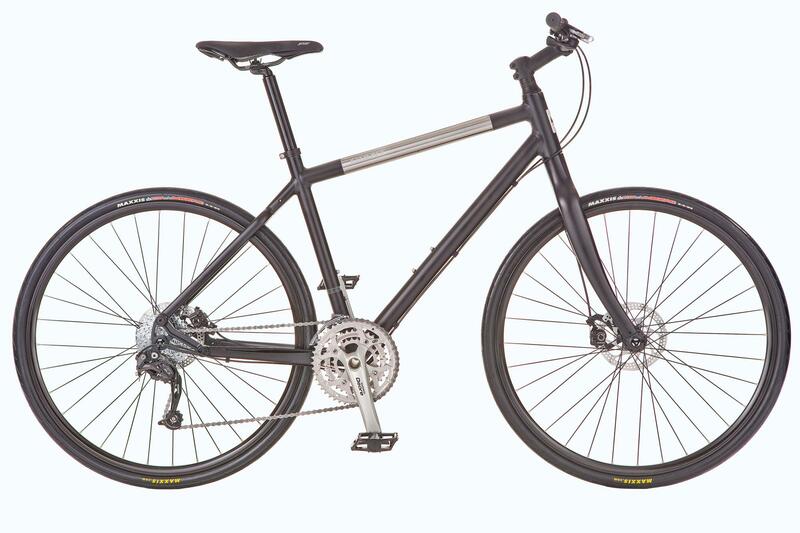 Keep in mind that the fire truck weighs about 100x the amount of a bicyclist. Shame, shame, shame. There is enough to go around in Buffalo. Just over two years ago, Maksym Sugorovskiy was killed in a tragic accident in Delaware Park in Buffalo. His mother and sister were also injured. The story broke my heart, and each and every day when I run through Delaware Park, I say a silent prayer for little Maksym and his family. The tragedy led to immediate—and unprecedented—political action by Governor Andrew Cuomo who downgraded the 198 expressway to a parkway and overnight changed the speed limit from 50 to 30. Neighbourhood proponents still stunned by the tragedy were pleased with the action. Later that summer, the newly qualified “parkway” was re-stripped, and crash barricades were installed along the park-side of the corridor. The New York State Department of Transportation promised to review the parkway and has since put forth a number of lacklustre plans that have been met with public disgust. The problem is complex and it’s growing. The first round of shame goes to Gov. Cuomo who scored political points for the immediate downgrade of the 198 and then never made another peep about it. The second round of shame goes to the grossly disinterested, disrespectful, and disengaged DOT. The third round of shame goes to the City and the Olmsted Parks Conservancy. Governor Cuomo mistakenly handed off the redesign of the 198 to the state DOT, which is both woefully under qualified and grossly negligent in its street design ability. Their significant failures litter the Western New York landscape and—frankly—make the streets of Western New York less and less safe. NYS DOT seems unable to plan, in any comprehensive manner. They approach planning as a street-by-street approach, which has compounded the problems surrounding the park. I could name a thousand examples across the region (and specifically around Delaware Park) but the dangerous concrete medians installed along neighbouring Main Street in the Parkside district are one example. These medians were installed with the intent of slowing traffic on Main Street. Instead, they have slowed traffic and provided an unsafe obstacle for motorists on icy and poorly lit roads to hit time and time again. The result is that rather than tool along Main Street at 30mph in stop-and-go traffic, frustrated motorists hemorrhage from Main Street to residential side streets to zoom by (and through stop signs) at 50mph in search of a “short cut” to their destination. Vehicles race through Delaware Park ring road which is poorly striped and unsafe for pedestrians and bicyclists. A vehicle taking a short cut through Delaware Park to bypass Parkside Avenue. This parkway in Estonia has clearly delineated lanes for pedestrians and bicyclists. Olmsted Conservancy vehicles regularly drive large vehicles on pedestrian paths and thoroughfares. Few safety precautions are taken by the Olmsted Conservancy. Most activities would not stand up to OSHA muster. A leaky Olmstead Conservancy vehicle left behind puddles of oil, a hazard for children, pets, pedestrians, and runners. More puddles from a different vehicle on a different day. This problem was compounded when much needed traffic calming measures were implemented to Parkside Avenue, adjacent to Delaware Park. Yes, the bump-outs and narrowed lanes have slowed traffic. Parkside (for a two block stretch) is undoubtedly safer as a result. The problem is that the parallel streets have become high-speed thoroughfares for speed-demon drivers in the neighbourhood. Likewise, since the traffic calming measures have been implemented on Parkside, the 198, and Main Street, speedy motorists have taken to using the Delaware Park ring road itself as a high speed shortcut from Agassiz Circle to Colvin through Delaware Park. Perhaps most disturbing is that this shortcut seems to be favoured by Olmsted Conservancy, Police and Fire vehicles zooming through the park to avoid traffic as well as private speeders alike. So, while we seemingly have endless press about ridiculous proposals to build a golf course in Delaware Park, the real issues of pedestrian and park patron safety goes completely unaddressed and unmentioned. Problem zones in and around the park are circled in red. Issues with the 198 are not addressed in this graphic. The re-design of the 198 has been mired in controversy and has been more than adequately covered in other fora, but I will add my disgust, disappointment, and disdain to the ever-growing chorus of Buffalonians when I say that the most recent public hearing for the 198 redesign hosted at the Olmsted School by the DOT was disgusting. The event was poorly planned, with three DOT officials sitting at a long table on stage while the regional director talked at the audience. The three adjunct DOT officials said nothing, as they played games and laughed at funny social media posts on their smart phones. Safety is no laughing matter and their behaviour was grossly disrespectful to local residents and to the memory Maksym who lost his young life due in part to their inaction and inattentiveness. If Governor Cuomo truly cares about Western New York, beyond a quick political score following an unspeakable tragedy, these three men would (and should) immediately find themselves unemployed in light of their callous and brazen breech of public trust. Like so many building, design, zoning, and planning issues in New York State, the problem is a decentralized decision making structure which aims for granular approval but misses the big picture. Why not take a neighbourhood approach to traffic calming and safety planning? More likely than not because the streets in question are a combination of State, City, and Park streets. (County streets it seems, in Erie County are, for the most part and in sharp constraint, impeccably serviced, always striped, resurfaced regularly, and are in decent repair.) When the State DOT implemented traffic calming measures on the Parkside stretch of Main Street, the 198, and Parkside, the City should have stepped in and added traffic calming—speed bumps, bump-outs, enhanced striping, rumble strips, or some combination—to the neighbouring residential side streets. They didn’t. The City and the Olmsted Conservancy should have taken the time and money to add basic safety measures such as speed bumps and stripes the ring road in Delaware Park. They didn’t. Central Park in New York City has clearly separated and delineated lines for runners, bikers, pedestrians, and vehicles along with speed bumps every 1/4 mile. It seems that most every other city in the world has recognized that painting stripes is a cheap and easy way at calming traffic as well as enhancing safety for bicyclists and other motorists. Despite this basic tenet of road design, the City of Buffalo remains asleep at the switch with more road surface than not suffering from faded lines, poorly discernible striping, and worse—roads with no stripping at all. I mean, seriously, how much can a can of paint and some time cost? I remember observing a work crew in St. Louis—prison work release folks—repainting stripes and arrows on the roadways. Why can’t New York State enact a similar measure? Are the citizens of New York not worthy of safe roads? At the very least, the Olmsted Conservancy should be unabashedly ashamed of their lack of action. Despite several grants to improve road and path conditions in the park, absolutely no improvements have been made over the past two years. Again, seriously, how much could it take to stripe the 2.5km ring road around Delaware Park? Unlike sister Olmsted Conservancies like Central Park in New York City, or the Emerald Neckless in Boston, the Buffalo Olmsted Conservancy has opted for the path of least resistance and inaction. The resultant negligence opens the city and the conservancy to significant liability when the next eminently preventible tragedy happens and is patently inexcusable. Call upon your elected officials—state, city, and local—to make your voice heard on this important issue. You wouldn’t settle for a uncooked pizza if it were delivered to your house… why would you settle for unsafe roads in your neighbourhood? Posted on April 7, 2010 Author mymonochromelifeCategories What I'm DoingLeave a comment on My new bike.